Canada wildrye, Elymus canadensis, a widespread species in North America. Photo by Russ Kleinman & Bill Norris. Elymus is a cosmopolitan genus of perennial tufted and/or rhizomatous grasses that, depending on the taxonomic treatment used, may include from 20 to 200 species found mostly in cool temperate parts of the world (Quattrocchi, 2006). Bit of a difference between those extremes, you may be thinking? 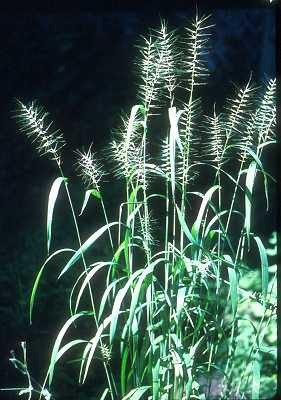 Elymus is part of the Triticeae, the grass tribe that includes wheat, rye and barley. Establishing relationships within the Triticeae has always been a difficult prospect; hybridisation and polyploidy have been major factors in the evolution of the tribe. Until the mid-1980s, most western authors continued to use a classification whose basic philosophy went right back to Linnaeus' Species Plantarum (Barkworth, 2000). This system, in which Elymus contained perennial grasses with 2 or more 2- to 6-flowered spikelets at each node of the rachis (the flower spike), was unashamedly pragmatist and concerned with facilitating species identification rather than describing relationships. A more modern classification had been proposed by a Russian author, Nevski, in the early 1930s but had not been widely accepted outside the communist countries. Among Nevski's most significant changes was the realisation that reduction in the number of flowers at each spikelet to one had occurred multiple times in various genera and his Elymus included species with from one to six flowers. Starting in the 1940s, an increasing number of cytogenetic studies had established that many of the genera of Triticeae contained chromosomally disparate subgroups that could be identified by the chromosome pairing patterns in hybrids between taxa. A number of authors had integrated some cytogenetic data into revisions of Triticeae but two authors in 1984 independently suggested that Triticeae classification should be based entirely on cytogenetic data alone. Not surprisingly, this lead to a botanical rift - even if one was willing to credit that genetic characters might be a better indication of relationships than morphology (and not everyone was), they were of limited use for field identifications. Before gene sequencing became widely feasible, identifying the cytogenetic nature of a grass required observation of cells undergoing meiotic division. However, genomic data remains a significant factor in Triticeae classification (Barkworth, 2000). Bottlebrush grass, Elymus hystrix, an inhabitant of the northwest United States from West Virginia to New York. Photo from here. Each of the genome groups that has been identified in Triticeae has been assigned a letter code: A, B, N, R, etc. Polyploid taxa of hybrid origin may carry chromosomes from more than one genome group; the genus Triticum (wheats), for instance, is characterised as AB (or some further complication thereof, such as AAB). The basic chromosome type of Elymus for North American representatives is StH, representing their descent from one or more hybridisation events between the genera Pseudoroegneria (St) and Hordeum (H; Hordeum includes the barleys) (Mason-Gamer, 2001). Taxa from other parts of the world currently assigned to Elymus all carry the St genome, but may have it combined with different genomes such as Y or W*. Future investigation is required to establish whether these taxa are appropriately placed in Elymus. *As ploidy level increases, the genome codes for various taxa can get a little hideous. The North American octoploid genus Pascopyrum, for instance, has the genome code StStHHNsNsXX. 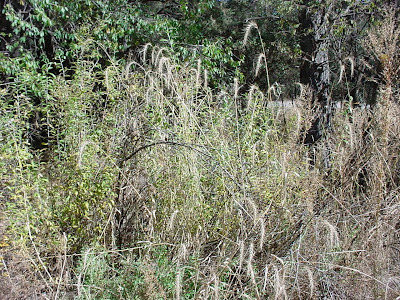 Economically speaking, a number of Elymus species are used as pasture grasses for feeding livestock. Quattrocchi (2006) indicates that Elymus grain is usable for food but I haven't found any references to specific species being regularly used as such (apart from indirectly with Elymus species being used in wheat outcrossing). 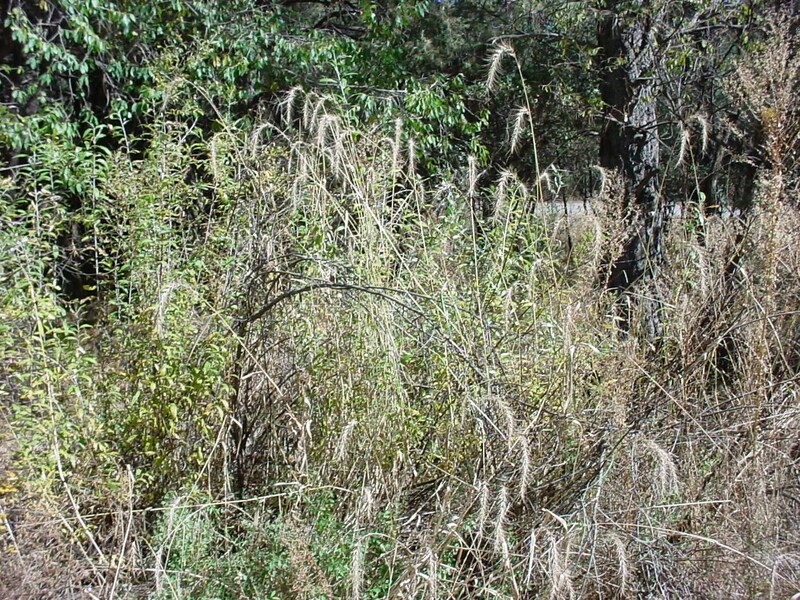 Elymus repens, couch grass, is a particularly tough rhizomatous species that seems to be encouraged in some situations and regarded as a curse in others (many authors refer to couch grass as Elytrigia repens instead but it carries the genome StStH - Barkworth, 2000). Barkworth, M. E. 2000. Changing perceptions of the Triticeae. In Grasses: Systematics and Evolution (S. W. L. Jacobs & J. Everett, eds) pp. 110-120. CSIRO: Melbourne. Mason-Gamer, R. J. 2001. Origin of North American Elymus (Poaceae: Triticeae) allotetraploids based on granule-bound starch synthase gene sequences. Systematic Botany 26 (4): 757-768. Quattrocchi, U. 2007. CRC World Dictionary of Grasses: common names, scientific names, eponyms, synonyms, and etymology vol. 2. CRC Press. I hadn't realised their roots were so tangled. I have had a herbal tea of couch grass but it was very like hot, wet lawn. Thanks for the link, Pat. I rather like Ken Fern's description for Elymus repens: "rather less than wonderful". I don't recall the context, but Toby White has written of organisms speciating with wilful disregard of the needs of taxonomists. These grasses would seem a case in point.